Judy Blume will be speaking at the University of Hartford on June 21st as a fundraiser for The Mark Twain House & Museum. I'll be interviewing her onstage and taking tons of audience questions. In preparation, I will be reading her complete works and blogging about the experience. Get your tickets here. My brother is very quiet and often indecisive. He's now twenty-five, so he's settled into adulthood as a kind and thoughtful introvert, but when he was a teenager the rest of my family said more than once, "Alex, what do you want? This or this? What's your plan? What are you going to do?" There is a distinct lack of writing about boys who are not leaders. (Please correct me if I'm wrong.) As a kid I read a lot about boys who survived alone in the wild, trained dogs, performed magic, solved mysteries, and otherwise took charge when adults were gone. I loved-- and still love--reading boy-centered books, because cool stuff tended to happen. You could wash up on shore with a black stallion and tame it to be your own. I was into that sort of thing. I never read Then Again, Maybe I Won't until this project, and I was surprised at how real the character's internal struggles felt to me. 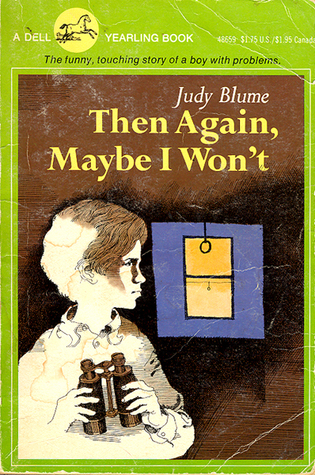 As in the case of Margaret, Tony is subjected to the drama of his own body, his parents' moving (moving is often the biggest event in a child's life, and is a frequent catalyst for change in Blume's books), issues of class, and some stressful friends. Nocturnal emissions are the least of his problems. His best buddy shoplifts, his parents have recently become New Money, and his grandmother is retreating to her bedroom on a permanent basis. All of this makes Tony angry and occasionally he resists. So I said, "Maybe she'd get some fresh air if you'd let her go back to doing the cooking." "How would that look to the neighbors?" my mother asked. "Like she's the maid or something!" And I said "who cares about the neighbors!" "Grandma's worked hard all her life," my mother said. "Now it's time for her to take it easy and enjoy herself." "She doesn't act like she's enjoying it," I argued. "Of course she is! Doesn't she love the color TV?" "How do I know?" I said. "Well, she watches it all day doesn't she?" My mother bent over to pick a piece of lint off the carpet. I was furious. I mean really furious! I wanted to punch Joel in the nose. I wanted to mess up his angel face-- to see the blood ooze out of his nostrils and trickle down his chin. I wanted to look him in the eye and say, "I've had it with you, Joel! You stink! Who do you think you're fooling? You think I'm afraid to tell the manager, don't you! Well, I'm not!" Then I'd beckon with my finger and call "Sir... sir....."
When we left the store Joel was still smiling but I was doubled over in pain. This is a very true and simple story: Tony does not know what to do, so he does nothing. Things eventually resolve without his actions or non-actions playing much of a part. But he is there, all along, watching, weighing, deciding what to do. Or then again, what not to do. It's a reminder that the introverts around us are as affected by events as those of us screaming, crying, and blogging--they just might be holding it in, working it out on their own. I think many more boys have this experience than just Tony and my brother. If I ever have a boy, I'll keep it in mind. Before I send him out into the woods with a Hatchet and an eagle, I'll ask him what he thinks. And I'll listen. Then again, maybe I... just kidding. I definitely will.